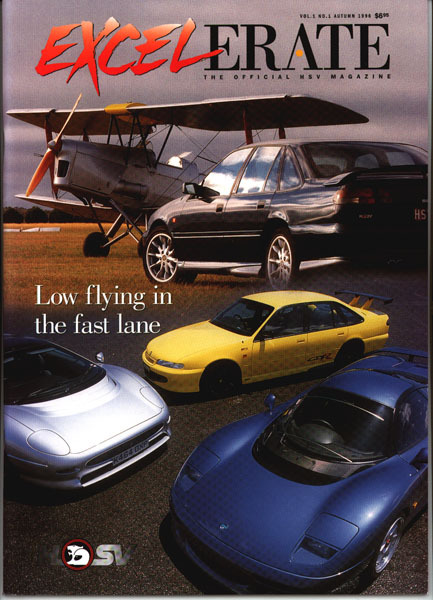 Welcome to the first issue of Excelerate, the official magazine of Holden Special Vehicles. The name blends the two factors that have made HSV the success it is today: the passion to do it better and the excitement of the extra performance of HSV cars. We have had the pleasure of meeting many owners of our vehicles and appreciated their no-nonsense, down to earth way of doing things. Through your letters and phone calls we have learnt that you participate in a wide range of activities and know how to get the most out of a day, whether it's on a remote outback station, an isolated post in Antarctica or on the world stage. Our special vehicles may be an indulgence or reward for pursuing excellence but they are also a vital component of a busy and varied lifestyle. This is our chance of "returning the call". Excelerate is a reflection of the pace and success of the people attracted to HSV vehicles. In its quarterly, full colour format there's a special blend of features covering the latest HSV news and activities away from the mainstream, like our cars and their owners. We'll introduce you to people associated with the cars and you can count on a healthy dose of performace motoring and motorsport. Whether you are a current HSV owner, a future owner or just want to be part of what's happening at HSV, I hope you will enjoy this first issue of Excelerate as much as I have. Note: You can get a copy of the magazine from a HSV dealer or HSV direct. If you own a HSV, talk to your club about getting a copy.